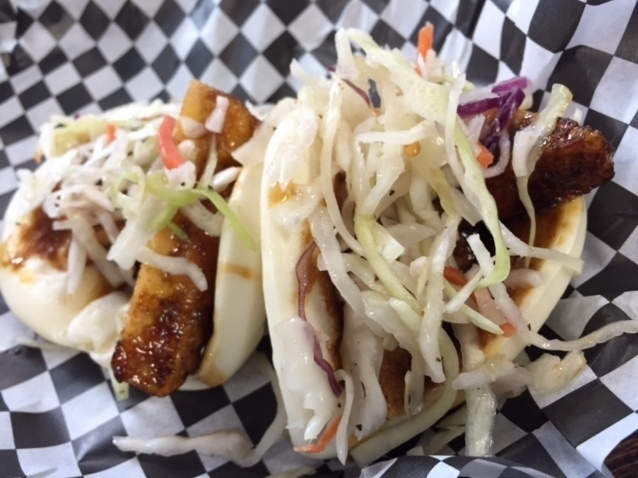 Sandwich Monday: The Baco : The Salt For this week's Sandwich Monday, we try a Baco — not the bacon bit, but the bao-taco hybrid from Saucy Porka in Chicago. The Baco: half bao, half taco. For years, Bac-Os have been the cool friend salad gets to hang out with, so naturally, it's a beloved name in food. This week we try a different sort of Bacos — that's what Chicago's Saucy Porka restaurant calls its bao-taco hybrids. Ian: This does pretty well even in the most competitive food category: things that start with b-a-c-o-. Peter: This is much more convenient than what I used to do, which was trying to breed takeout from Wao Bao and Taco Bell. One of Peter's eyebrows enjoys the taco side while the other enjoys the bao side. Miles: This is my favorite Mexican/Asian hybrid since the Oscar-winning film Y Tu Godzilla Tambien. Ann: This is my favorite Latin/Asian hybrid since Alberto Fujimori. Just kidding. He was a mean dictator. Peter: These are good, but I'm concerned about the trend of combining national cuisines. If this continues, every restaurant will be serving the same food: an enormous bucket of everything. Here's what happened: I was trying to take a photo of the Bacos, and God himself reached down from the heavens and stole one. Miles: It's traditional to pick up Bacos with one hand and one chopstick. 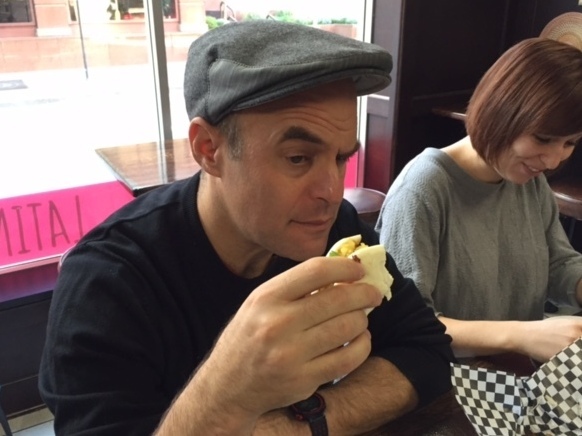 Peter: The bao bun is like a soft, comfy pillow. It's as if they wanted the fillings to have a nice nap. 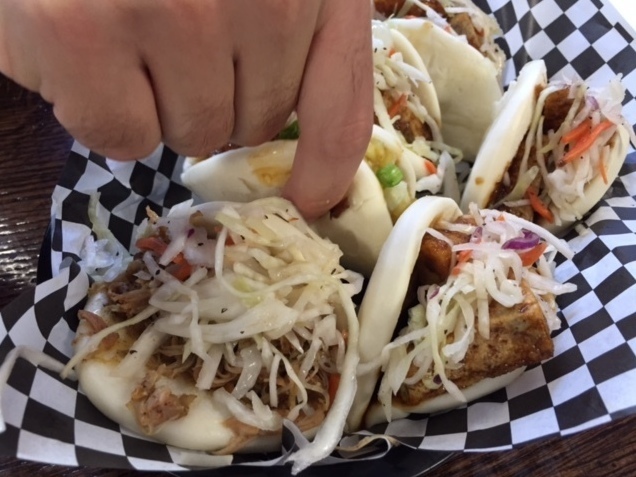 Eva: A bun filled with pork carnitas is a beautiful analogy for each of us after lunch. Peter: I'm glad we have the word "fusion," otherwise we'd be calling these things "conjoined cuisine." Ann wonders: Why do we always stop at two cuisines with fusion food. What about a gefiltebacoguettezzabangeroutine? Ian: I'm all for fusion food, but when will scientists finally achieve fission food? Peter: Yeah, I hate it when it gets cold and it's cold fusion food.